"Sometimes you feel like a nut...sometimes you don't." 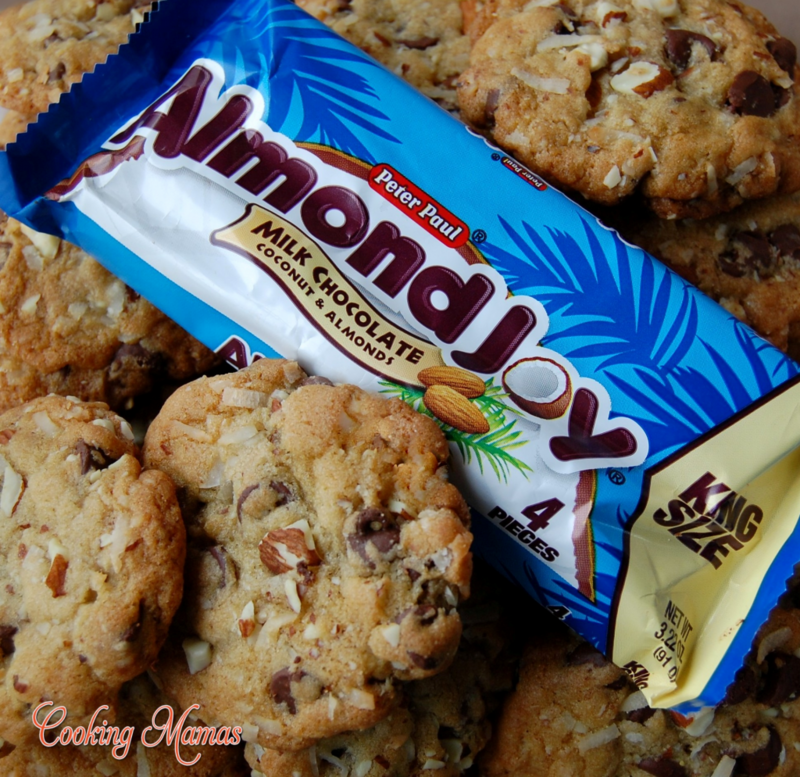 These Almond Joy Cookies filled with coconut, chocolate, and almonds, taste like the famous candy bar, Enjoy! Preheat the oven to 375 degrees. Grease cookie sheets or line with parchment paper. In a large bowl, cream together the butter, sugar and brown sugar until smooth. Beat in the eggs, one at a time, then stir in the vanilla. Combine the flour, baking soda and salt, stir into the creamed mixture until well blended. Stir in the chocolate chips, coconut and almonds. Drop by rounded spoonfuls onto the prepared cookie sheets. Bake for 8 to 10 minutes. Allow cookies to cool on baking sheet for 5 minutes before removing to a wire rack to cool completely. OMG., these are sooo good!!! Thank you for sharing… No more plan chocolate chip cookies for me any more..
Is the 5 c. Chocolate chips correct? Seems like a lot so wanted to confirm. About how many cookies does this recipe make? Thanks. These cookies are awesome! Thank you for the recipe. I’m making these for a ladies fellowship. I’m sure that they’ll love them too. Will this be like a mound’s cookie without the almonds? I am making these tonight for a cookie exchange at work tomorrow, but would also like to use the extra dough to make the rest for Thanksgiving. Should I freeze some of the dough? or can I leave the dough inthe fridge covered until Wednesday and make the rest then. Also do you use light or dark brown sugar? Do you think it would be just as good using milk chocolate chips? I am making these right now, I refrigerated them over night and they are not flattening out at all… any ideas?? hi! I love almond joy so im sure ill love this recepy!!! The butter should be melted ? How many bars are 1 cup? Hi Katia, The butter is NOT melted, but softened, to room temperature. I have changed the recipe to reflect that. Thank you for bringing that to my attention. I don’t use bars of chocolate, I use baking chips. I suppose you could cut bars into small chunks, but I prefer the chips. I hope this helps? These are my grandson’s favorite cookie! I’m making them for him for Christmas this year! Thanks for sharing your recipe. You’re welcome Collette, Merry Christmas! I just tried this recipe out for a cookie swap party I attended on Saturday. It was delicious!! I loved it and so did everyone else. I only needed to make 2 dozen for the party so I’ll be using the rest of the dough for Christmas. I made these cookies for work and everybody loved them! Hey.. The cookies are great. Thanks for sharing. I was given this recipe yesterday and been looking online to see if there was a better one. There isn’t! I’ll be making them today to try but really making for a friend who LOVES coconut so just testing them out! Can’t wait! And thank you. I’m a baker too so always looking for a new GOOD recipe. Sounds delish, I love almond joys! I prefer to weigh my ingredients…any idea how much your cup of flour weighs? Or could you share how you measure the flour? This can make all the difference. Thank you! The cookies were good, but I expected more of a coconut taste. I think I’ll try substituting some of the vanilla for a little coconut extract. Cookies dough does make exactly 8 dozen. I baked the cookies for 4 minutes then used a solid spatula to flatten them a bit. Then baked for another 5 minutes. Turned out beautiful! Great idea Susan! I think I’ll try substituting 1/2 the vanilla extract for 1/2 coconut extract! So excited to try this recipe. One question. Is the coconut sweetened or plain?